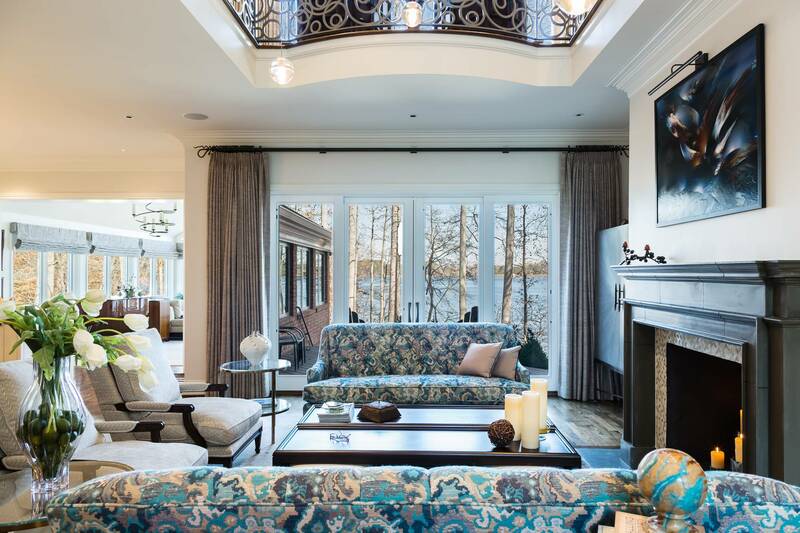 Today’s Design Showcase features interior designer Rebecca Johnston of R. Johnston Interiors and the lush details of her Lake House interior design project, centered within a gorgeous home in North Carolina. 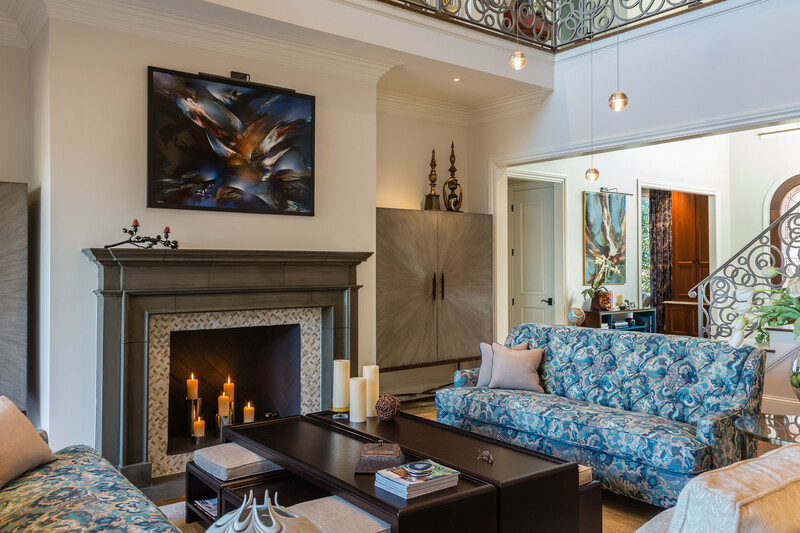 For this project, Rebecca utilized a number of sumptuous STARK fabrics on sofas, draperies, armchairs, roman shades, and an ottoman – to name a few. We sat down with Rebecca to talk about how she designed this particular project, as well as delve deeper into her creative process, where she finds inspiration, how she got into the design world, and more. As an accountant, Rebecca gained a sense of the value of organization and details. When she left the accounting world to become a stay-at-home mom, she suddenly had a lot of free time. During this period, Rebecca came to discover a true passion for interior design. It was the first time in her life she’d had any extra time to explore other interests, and now she had found one that was an incredible fit. Designing her own home soon led to designing the homes of friends, and eventually she returned to school to study interior design as her next profession. In doing so, she realized interior design was the perfect blend of her creative and analytical sides. She has now been designing full time, and loving it, for almost a decade. 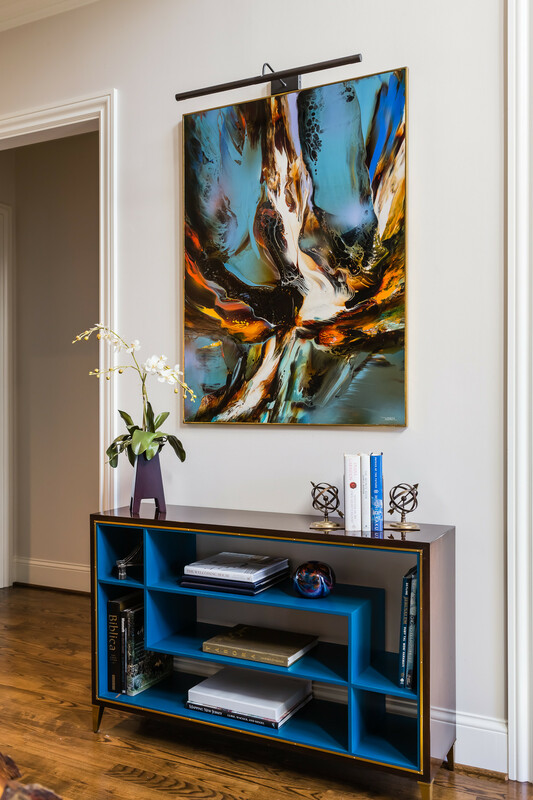 Rebecca’s creative and analytical sides also work in harmony when making sure that the clients’ vision for their space and the things that they want to accomplish in the project are fully considered from every angle. All of the home’s functional goals must be taken into consideration so that the final project meets not only their stylistic vision, but also their family’s unique needs. In a word, the lake was the heart beating at the center of the inspiration for the entire house. 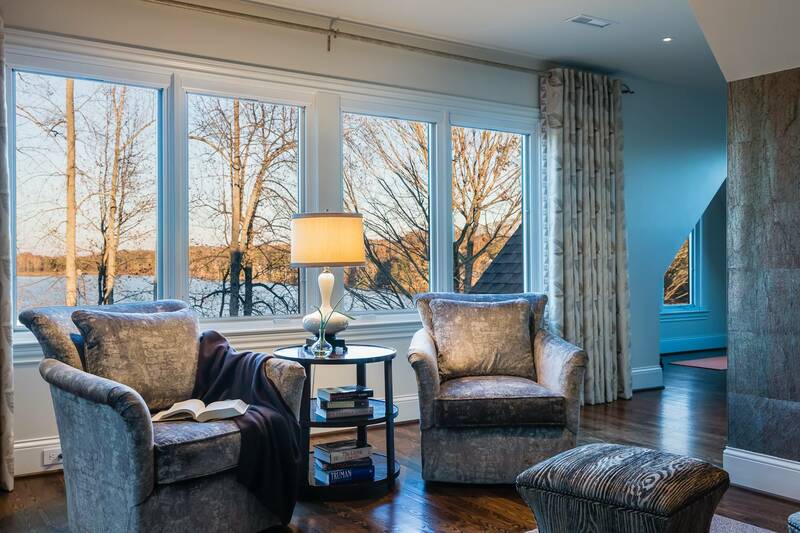 The client bought the home for the lot and impressive view, but the indoor space had to be completely remodeled. It was a traditional home that was veritably overwhelmed with heavy, deep crown molding. In the old design, walls really broke up the space. There was no open space to speak of and the house felt exceptionally dark. The goal of the remodel was to expose the house to the dazzling view. Removing the walls made the space more airy, and also physically allowed for more sunlight to enter the room. Essentially, the project was intended to create a transitional interior design for the house. In addition to the molding (the size of which was drastically reduced in the remodel) heavy chair rails spread throughout the house were also removed. 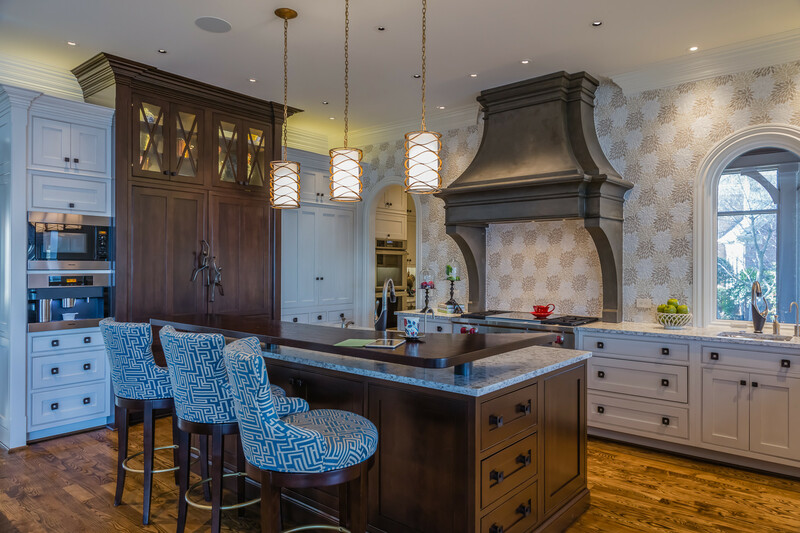 Everything was streamlined to open up the house and bring more light in, modernizing the space without losing the elegance of traditional design. The selection of furniture and fabrics played heavily into the newly transitional style of the space. Rebecca found the fabric at STARK and quickly showed it to the client, who fell in love with it on the spot. From the sunroom to the great room to the office, the Edmond Petit fabric served as the key inspiration piece and color palette for the entire home. Although Rebecca had not used STARK in the past, she was intrigued by the fabric possibilities when contacted by a showroom representative who found her website and paid her a visit with some fabric samples in hand. Rebecca instantly fell in love with the STARK fabric tableau, and the rep ultimately proved to be a great resource for her throughout the course of the Lake House project. 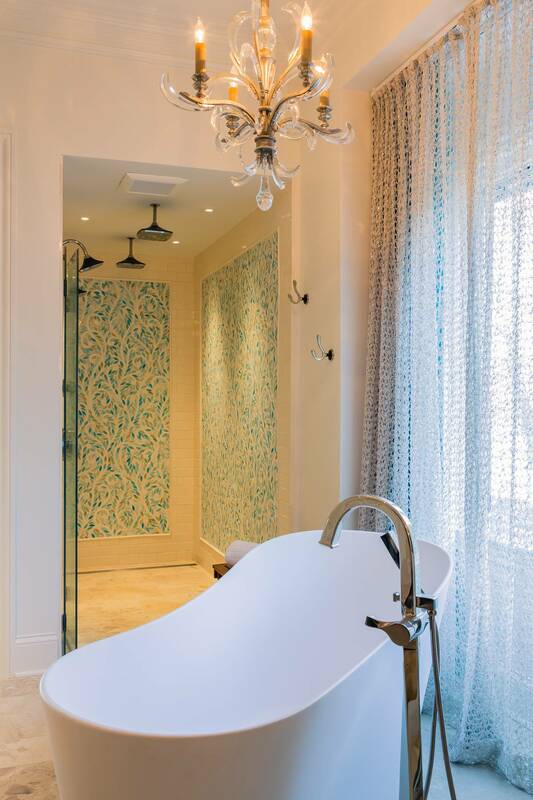 STARK fabrics offer a variety of creative possibility, which Rebecca surely made the most of when designing this home. 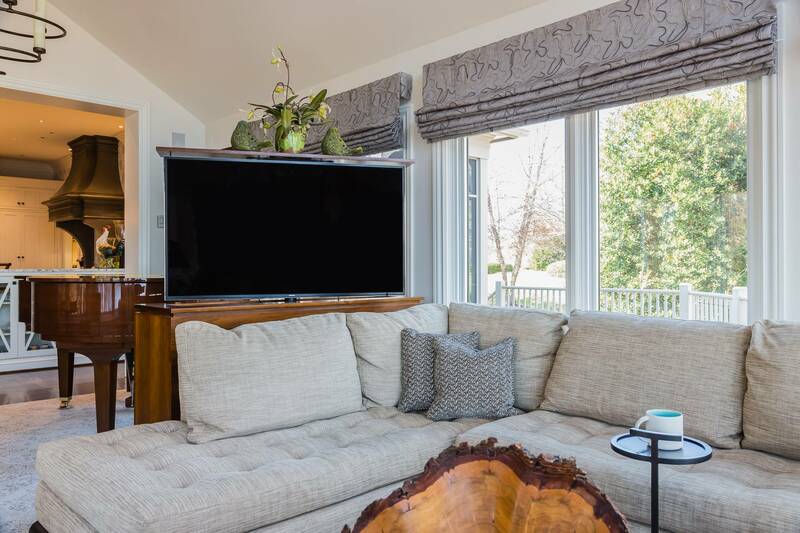 In fact, she noted that many little details in the project were completed with just the right touch from STARK, such as a geometric trim she happened to come across that juxtaposed perfectly against some fabric with a leaf pattern she used in the lounge. STARK is known around the world not only for rugs, antique rugs, and carpet, but also for their varied, luxury fabric collections as well. Interior designers who work with STARK also get the opportunity to enjoy the many benefits of the trade benefit program. Browse the World of STARK for even more insight into what we do, who we work with, and more.